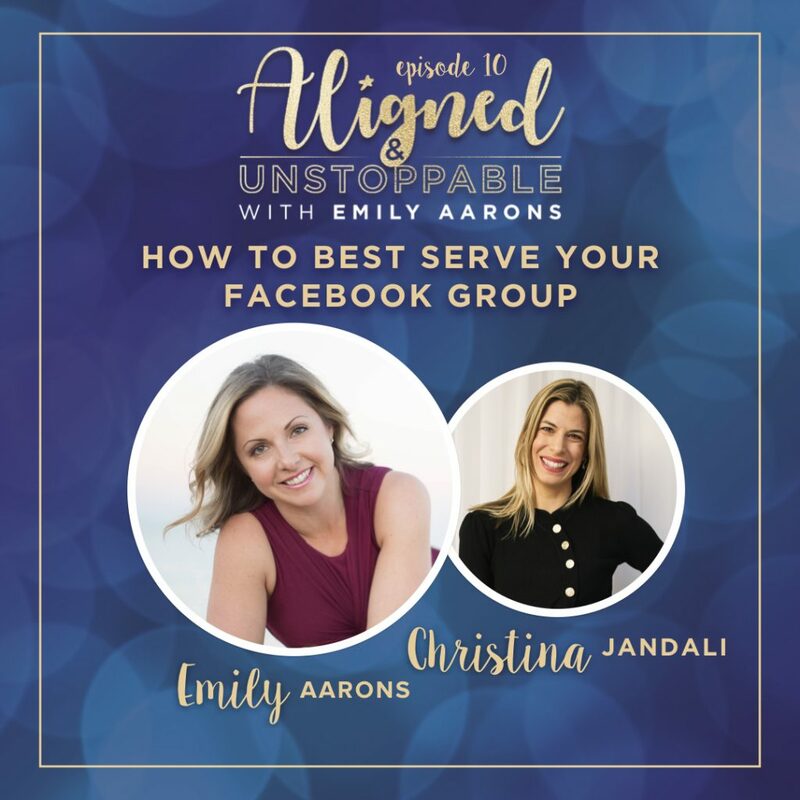 In our 10th episode of the Aligned & Unstoppable podcast, Christina Jandali joins Emily to discuss proven strategies that help online business owners stand out, get seen and create consistent profits using a free Facebook Group. Christina is a confidence-boosting, cash-creating Success Coach for entrepreneurs “whose dreams stretch way beyond a corporate career”. Listen in as she gives advice on winning content strategies, the importance of consistent growth and creative ways to make offers to your clients. Christina’s life changed when her daughter was born: She made a commitment then to pave the way for her by showing her what it’s like to pursue your dreams. She was growing her coaching business painfully slow by attending networking events when she discovered the power of the online space. Even as she began to build her list online, she still felt things were really cold and there was a missing connection with people. This is when she came up with the idea of starting her own community – her own Facebook Group, and her income grew substantially. Initially, her primary focus was on growth: She grew the group to 865 members in the first month! Don’t forget to consistently make offers to your clients. Conversion rates from Facebook groups can be 2-5X more than from email lists. Your Facebook group runs parallel to your email list: The conversation happens in the group and the email list is the actionable piece. Engagement in your group is going to be dependent on the REACH of your posts, so you want to make sure there is consistent growth in your group. >> THANKS FOR LISTENING! GET MY FREE ABUNDANCE MEDITATION HERE! Ready to dive deeper? Join the Mastery & Ascension membership to learn the spiritual tools to break through your blocks, align with your highest self, and gain clarity to become FULLY Aligned & Unstoppable! Simply CLICK HERE to join!